This past September 11th, a date of political significance for a number of different reasons, I participated in the first of what I hope will be a series of events combining readings from my novel with discussions of social activism. The event was at a local cooperative called Coop la Maison Verte and the theme was cycling as a responsible form of urban transportation and a key ingredient to making our cities more green, healthy and sustainable. Participants in the event included activists and spokespeople from cycling and pedestrian associations, organizations promoting environmental justice and sustainable urban living environments, and concerned community people. Once, on a radio interview, I was asked whether I thought that artists have a special responsibility to create art of social and political significance, or whether it is better for art and politics to remain separate. What I believe is that it is not possible to separate art from politics. If you are communicating something, it is going to have some kind of political content. It’s only that people will notice this less if the politics being expressed are mainstream or status quo. Of course, art can be overtly political or more subtly political, but for me, being devoid of any political meaning is almost impossible. In the case of speculative fiction, it is even more obviously the case that social and political issues will slip into the work. SFF usually involve some amount of world building, and how you build that world says a lot about what you think of current social and political realities, and this is true whether it is a future world, a parallel universe, or alternative history. In the case of Cycling to Asylum, I play with dystopian and utopian themes. As all writers of those genres, I do this to sound an alarm for trends that seem frightening, while at the same time emphasizing ideas might help us build a better, more just world. For me, having political ideas and content in my novel was a given. For this reason, it is both a pleasure and a relief to be embracing this fact through the types of events that I doing, starting with September 11th at Coop la Maison Verte. 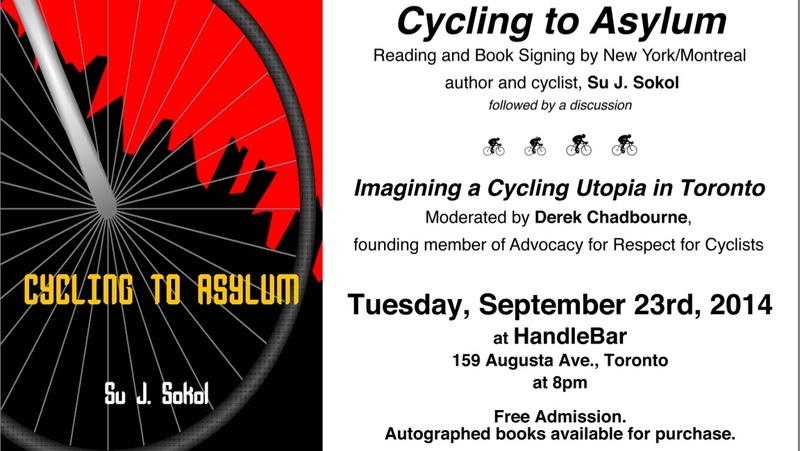 Like my event at Coop la Maison Verte in Montréal, on September 23rd, I will be combining readings from my novel with a discussion of urban cycling, only this time in Toronto. The event will be hosted by Kensington Market’s HandleBar, a venue that is oriented towards cyclists. Joining me will be cycling activist Derek Chadbourne who will moderate a discussion on what a cycling utopia in Toronto might look like. On the eve of a mayoral election, I hope that activists and community members will come together and share views on this important ingredient to a safe, healthy and sustainable city. Finally, I am in the midst of trying to organize an event about immigration rights with a representative of Solidarity Across Borders. This is a topic that is very near and dear to my heart, and it is arguably the most important theme of Cycling to Asylum. Stay tuned for more news of this and other events!